It is time to enforce water conservation with landscape design as Southern California is having a heat wave this January. The rest of the country has recently dealt with a polar vortex, snowfall measured in feet, and a serious winter. And then there were tornadoes in the Southeast a week ago. Who knows what’s on the horizon next. This all points to the extremes of climate change. Of which, we do know we can expect more outrageous unprecedented weather. Currently over 70% of the state of California is experiencing an extreme drought. A few years back, the City of San Diego did issue water restrictions for irrigation. Ten minutes maximum, three times per week. Most of my clients relayed that this wasn’t enough to sustain a lush, healthy looking, green lawn. 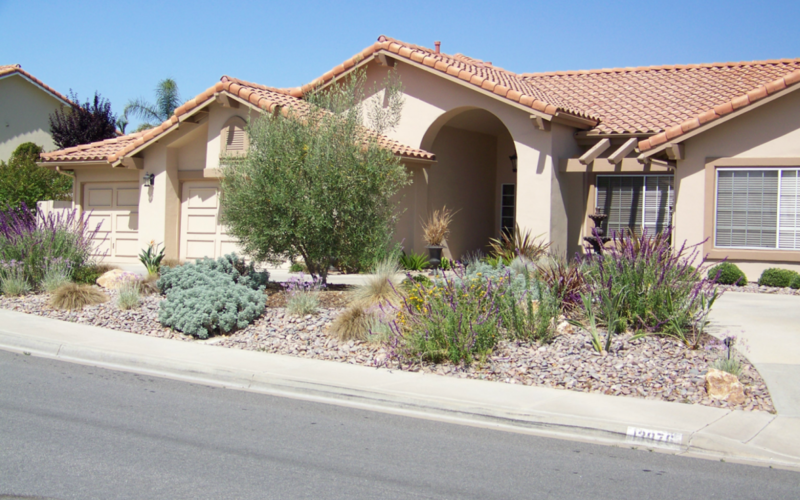 Many were willing to forgo the turf and get into the new wave of xeriscaping their front yards and using artificial turf in their backyards. And to think that ten minutes of water, three times per week would be an extreme for California native plants once they are established. With more than 60% of our potable (safe, drinking) water being used to irrigate our landscapes, one has to feel somewhat responsible for the future of our most precious resource, water. We can’t live without it. And to think that San Diego imports 90% of our water from the Northern California and the Colorado river, which by the way is also running low. The Colorado river was 2013’s Most Endangered River. Along with this current drought, the snow pack in the Sierras is way below the norm as well. So guess what, that means our future water sources are going to be limited. Climate change predictions indicate by 2050 the river’s flow will be reduced by 10 to 30%. Water conservation via landscape design is not a critical issue. NOW, is the time to act! This is more than just a city or state issue. Everyone has to do their part, whether turning off the faucet when brushing their teeth to changing sprinkler heads and tearing out the tropicals and turf… the “Two Terrible T’s”. We live in a desert, tropical plants don’t belong here. We need to become more familiar with “climate appropriate plantings” and or California Native Plants. Sure, we can still do a Mediterranean version with natives or other water wise plant materials. Along with a multitude of colorful, easy care plantings are the huge array of succulents and ornamental grasses. Using more cobble, gravel, boulders and decomposed granite to cover significant areas are another way to use NO WATER in the landscape. Even improving our poor soils with more organic matter will offer some solution to allow the soil to retain water. And, lastly using at least 3” of mulch to keep soils from losing water is one other way to offset this crisis. Think about sustainability in the landscape. If you put water on it, make sure it gives you something back in return. Think Citrus (dwarfs are fantastic) Stone fruit trees (beautiful spring blossoms) herbs, like sage or rosemary. Persimmons are really nice small to medium sized trees. Vegetable beds are fine too. Sure, it doesn’t hurt to capture rain water from your roof top with rain barrels. But we need ample rain to make this worthwhile. I’m a big advocate for using grey water from showers or laundry, but you need the right conditions (raised foundation, the correct grade, etc.) to be eligible for its benefit. The one thing we can count on is change, and yes, taxes, death, and cracks in concrete. The world is changing around us, every month we experience some extreme or frightening statistic. The key is we have to adapt to those changes and to do that, we have to take responsibility. We’ve seen wars fought over oil, we’ll see wars fought over water rights in the future. We know, (we hope) we haven’t gotten past the tipping point of managing climate change and man’s impact on this planet. What are you waiting for? Get rid of the lawn and do your part to lessen the demand for live giving water. Contact Letz Design Landscape to learn of more ways to reduce your water bills through water conversation through landscape design.